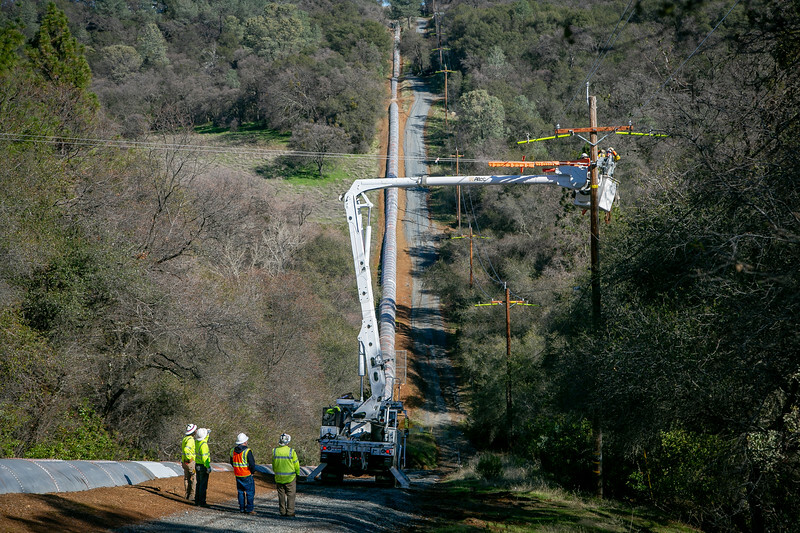 It can be hard to quantify the amount of grid hardening work in Local 1245’s jurisdiction that’s associated with PG&E’s new Community Wildfire Safety Program, but one way to get a sense of the magnitude of this project would be to imagine taking all of PG&E’s power lines in Tier 2 (elevated fire risk) and Tier 3 (extreme fire risk) areas and lining them up end to end – if you did that, the lines would circle the entire world 1.5 times! Addressing potential fire hazards over such a massive area is a herculean endeavor, and IBEW 1245 members undoubtedly have their work cut out for them – but they are more than up for the task, and our union currently has dozens of crews working in every corner of the service territory to mitigate wildfire risk as much as they possibly can. The Utility Reporter caught up with one such outside construction crew from Summit Line as they worked on a grid hardening job in the PG&E right-of-way on Penstock Trail in Auburn. On the day that the Utility Reporter visited the job, Rubadue and his crew were finishing up the last cut-over from the old wire to the new wire. Once that part of the job was complete, the next step would be to wreck out the old wire and remove the old poles. Like most jobs in high-fire-risk areas, they had their fair share of challenges to contend with, but the skilled crew took it all in stride. Rubadue first joined Local 1245 as a groundman, completed his line apprenticeship out of state, and then returned to 1245 after he topped out as a journeyman lineman. 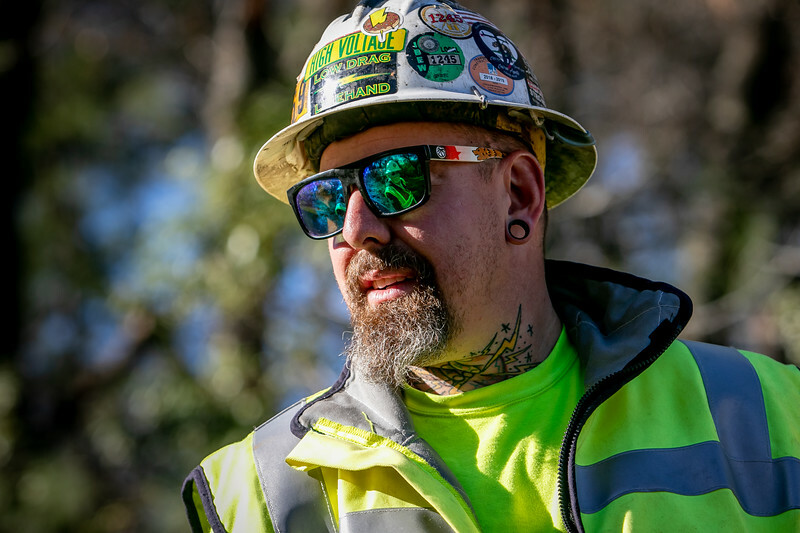 His IBEW union pride is exceptionally apparent to all who cross his path – he has an eye-catching rendering of the iconic IBEW union logo tattooed on his neck, and his hardhat is emblazoned with IBEW stickers.